We got fed up with breaking keyboards and bought Dell Vostro 14 5459 laptop. After reading customer feedback, we decided not to mail order or rely on Dell support and customer service, but to buy the laptop from a reseller and test it before taking it with us. All was well at the shop, BIOS hardware tests were passed, Dell website confirmed the 2-year parts only warranty (POW), and factory installed Ubuntu GNU/Linux showed the correct processor, memory, and hard disk. Later we tried to verify the amount of dedicated memory in NVIDIA GeForce 940M GPU. At first it looked like there was only 1 GB. To verify that, we installed Windows 7. When Windows was up and running, we discovered there was a wrong GPU but the promised 4 GB of memory. Dell has been selling Vostro 14 5000 Series Laptops since mid-October 2015 and there is not a single review at Dell's website. We posted the following review over a week ago. With the review moderation time being 1-7 days, one can only speculate why there are no reviews for this 5-month-old product line. The review rating could have easily been 3 stars with proper pre-sales and after-sales. Bought Dell Vostro 14 V5459-50814G-DOS from an authorised Dell reseller. In the shop we double-checked warranty conditions using the computer's service tag on Dell's website and there was one-year onsite and a two-year POW. 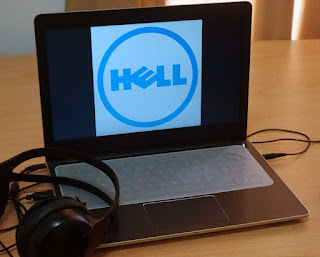 However, when Dell customer care kindly updated the warranty dates to match the date of purchase, they removed the two-year POW warranty, which was one of the main reasons for buying the laptop. Later, Dell customer care tried their best to fix this issue. Unfortunately, Dell corporate policy made it impossible. So if you need the two-year POW, you are not going to get it. Despite the reseller's product title, the laptop does not have DOS but GNU/Linux Ubuntu factory installed. This is actually not a bad thing at all, assuming that is what you want. The system was crashing all the time when used out of the box. If you are not able to update it, this laptop will be of very little use for you. The keyboard (FDKH0) is exactly the same, notoriously bad one that is used in Inspiron (read the reviews), so if you buy this computer because it has a better quality and more durable keyboard, you are not going to get it. The upside is that those bad keyboards are very very cheap and there are plenty of pirate manufacturers to satisfy the booming demand for replacement keyboards. Be aware that the GPU is NVIDIA GeForce 930M, not 940M what the reseller sold and what they wrote to the receipt. One more thing. Don't expect the system to have a fingerprint reader. It is OPTIONAL no matter what all the online shopping websites and Dell resellers tell you. Dell Vostro 14 5459 laptop works with GNU/Linux and Windows 7. However, the warranty suddenly dropped from 2 years to 1 year, laptop had low quality keyboard, wrong GPU, and missing fingerprint reader. That is why the our review score is only 1 out of 5 stars. You can use the service tag JV5JK82 to check the warranty details and exact components. Feel free to share your own Dell experiences! This review was originally posted at travel blog on March 18, 2016.